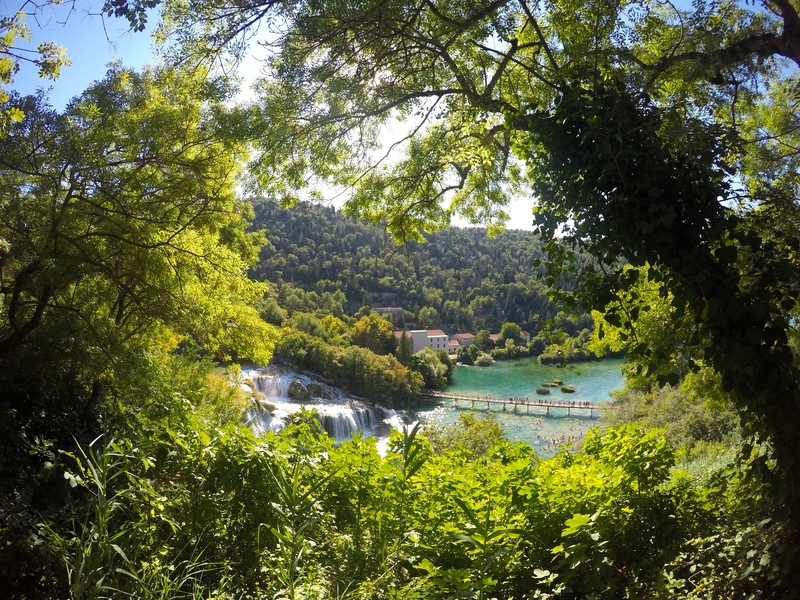 If you are planning a trip to Croatia, make sure that a visit to the Krka National Park is at the top of your list. It was by far one of the most beautiful places I have ever been. After finishing our summer with The Yacht Week we decided to spend one of our last days renting a car and making a day trip to see these spectacular waterfalls (emphasis on “see” because that’s all I had planned on doing). The five of us took a quick bus ride to the bottom of the hill and then climbed through gorgeous rivers and trees, stopping every couple of minutes for the many insta-worthy pictures. Finally, we had arrived. I cannot express how breathtakingly beautiful the falls were. The water was vibrant shades of emerald green and turquoise, so clear you could see straight to the bottom. It was a warm Croatian summer day and thankfully you’re allowed to swim around at the bottom of the waterfalls, but apparently that was not going to be enough for my friends. We climbed up the side of the waterfall, past the “do not enter” signs and found a group of locals swimming and playing cards at the top. Already feeling like a badass, I heard one of the boys ask how we could jump off the waterfalls…my heart stopped. The local said that it was not possible and I was immediately flooded with relief…until I heard my friend offer him 200 Kuna to take us. Much to my dismay, the Croatian boy was more than happy to take us jumping off of the MASSIVE cliffs after a little bargaining. As terrified as I was, I figured this would probably be a once in a lifetime experience and I would always regret it if I didn’t go with them. This ended up being one of the craziest and most exciting days of my life. Thankfully we captured it all on film (which I posted below) or I don’t think anyone would have believed us. You had to swim as fast as you could from each of the levels because of how strong the current was. When we got to the edge of each waterfall the boy would have to point out exactly where we needed to land in order to avoid hitting a rock…no pressure. I want to say there were about four or five big ones that we jumped off and a couple little ones. There really wasn’t any time for hesitation once we stood on the top. The adrenaline kicked in after the first jump and we were loving life. I remember my cheeks hurting from smiling so much that day. It was definitely one of my favorite experiences in Croatia. If I have learned anything from my travels so far, it’s that you need to get comfortable with being uncomfortable. Pushing yourself to do things you never would have expected is what makes life an adventure. So the next time someone asks you if you want to spend the day jumping off waterfalls, you better say yes! Be careful! Love the post and video even though it seems risky. It’s the parent in me coming out in know. Life does begin at the end of your comfort zone but be careful about some kinds of risks. Fun wonderful day and massage those smiling muscles! Awesome video and post! I love Krka (and Croatia in general). Hope you have as much fun in Australia!